My family was raised on a small 30 acre farm in Ohio. We milked cows, made our own butter, had a HUGE garden, baled our own hay, butchered our own pigs, cows and chickens and we canned the vegetables we grew. We drank milk every day. It was fresh, raw, organic, grass fed, hormone free and healthy! Back then, all cows were grass fed. That’s what they are supposed to eat – GRASS. They have a complicated digestive system designed to eat grass. NOT CORN or grain! So, feed a cow mostly corn and guess what? You have a sick cow. Sick cows don’t grow well. So guess what? They receive antibiotics to keep them fighting off the infections AND hormones to make them grow despite their illnesses. ICK! And then…. milk the cow and serve up that antibiotic and hormone laden stuff and call it healthy. Well, it’s not! After the cow has released its milk, the milk is now pasteurized. That process alone changes the proteins in the milk and makes them non digestible for humans. Did I mention yet that cow’s milk is made for baby cows. 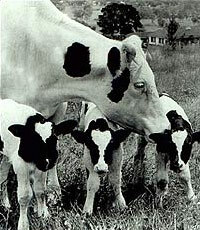 Consider this… Feed a baby cow the milk sold to humans and they won’t live long enough to reach the age of butchering. Moreover, calf’s fed pasteurized milk will be underweight, low energy, and have poor quality skin and fur, which cannot be used for leather. Furthermore, if you are drinking milk because it’s “does a body good” or “builds strong bones” consider this: The calcium that WAS in cows milk is attached to those proteins which were denatured in the pasteurization process and guess what? We don’t get the calcium from the milk! If you are drinking cows milk, organic or not, if it’s pasteurized (and you have to work really hard to find a farm willing to sell it to you raw), you have to ask yourself WHY? Like the taste and have no expectations of health? Think moderation < 1 glass/day. If you are looking for calcium – get it where the cows used to…. Green Leafy Veggies!